We admit, it's not the most fashionable piece of headwear around. But then again, neither is dry, brittle hair. If you're a fish in the water and can't keep yourself out of pool, then getting yourself a swim cap is an absolute must. It will protect your hair from the effects of chlorine, while keeping it out of your face--and pool drains. It also will help reduce drag, making you swim faster. 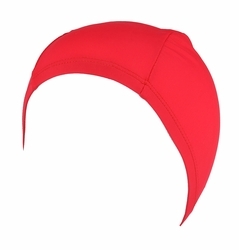 So whether you're gearing up for competitions, or just out for the fun of it, add this cap to your gear! One size fits all…from kids to adults!